Welcome to My Bizideo Console! 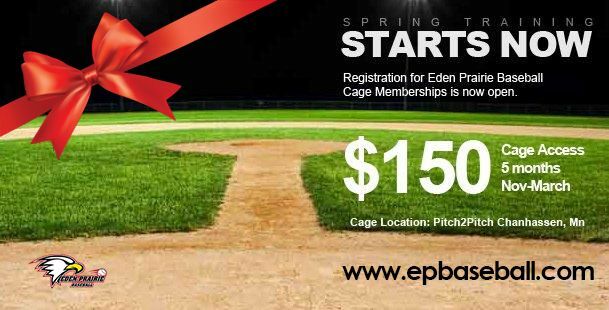 The Eden Prairie Baseball Association is pleased to once again offer EPBA members a 5 month Pitch2Pitch cage membership from November 2, 2015 to March 2, 2016. The cost of the membership is $150. As a member, you will have access to EPBA assigned cages on scheduled days of the week and on weekends to hit and throw. The P2P facility is located at 8115 Century Blvd, Chanhassen (behind Lifetime Fitness off of Hwy 41 and Hwy 5). Over the last several months’ EPBA has adopted a program developed by the Positive Coaching Alliance called “Developing Better Athletes, Better People”. It is a nationally recognized program with the purpose of transforming Youth Sports into activities that go beyond the scoreboard. Each month EPBA will be sharing with you concepts and ideas from this program. As with all change, it takes time, as a community we hope that you embrace the culture and become an ambassador of it. Our intent is to have open communication, visibility and the fortitude to hold fast to its concepts.